Each year, Cal-IPC honors members who have shown exceptional dedication and creativity in protecting California’s wildlands from invasive plants. Honorees receive their awards at the Symposium banquet in October. If you know someone who deserves one of our five awards, please share their name, accomplishments, and suggested award with Cal-IPC by July 31. 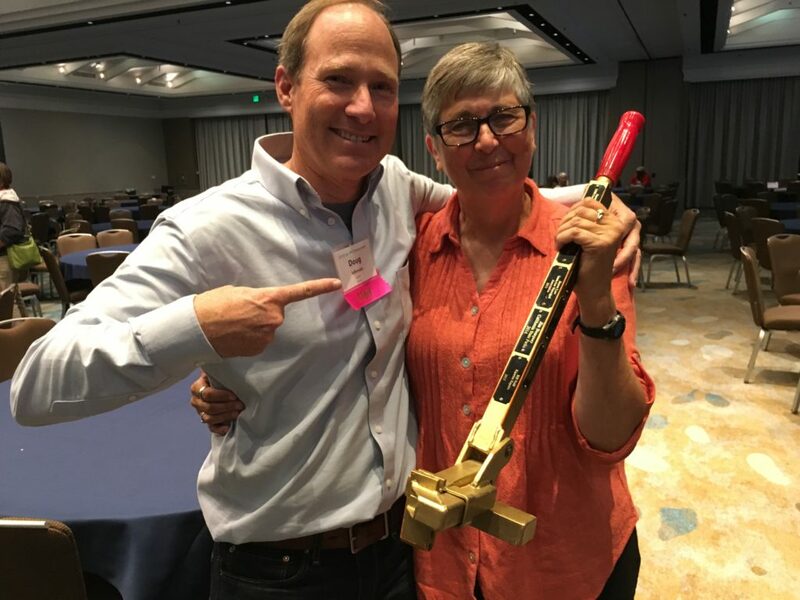 For years of tireless service and leadership on invasive plant issues in California. Named after Jake Sigg, longtime wildland weed worker, activist, and Cal-IPC supporter from San Francisco. 2013: Jason Giessow, Dendra, Inc.
For the “land manager of the year” who leads exceptional on-the-ground management efforts. For creatively spearheading actions or creating partnerships that make exceptional progress in protecting California from invasive plants. Named for Ryan Jones, an incredible artist and youth leader for the Golden Gate National Parks Conservancy, who died much too young in 2008. 2014: Joanne Drummond, Fire Safe Council of Nevada County, for creating the Scotch Broom Challange. 2013: Josh Volp, Orange County Conservation Corps. 2012: Susan Schwartz, Friends of Five Creeks. 2011: Andrea Williams and Daniel Gluesenkamp, for founding the Bay Area Early Detection Network. 2010: Jo Kitz, Mountains Restoration Trust. 2009: Graduate students Sara Jo Dickens and Heather Schneider of UC Riverside, for starting the Cal-IPC Student Chapter. 2008: John Anderson, Hedgerow Farms, for pioneering work incorporating native grasses into restoration projects. 2007: Richard Zembal, Santa Ana Watershed Association, for years of work promoting funding for arundo control. 2006: Sharon Farrell, Golden Gate National Parks Conservancy and Maria Alvarez, Golden Gate National Recreation Area, for years of getting the Bay Area to volunteer. Joanne Drummond received the 2014 Ryan Jones Catalyst Award. 2005: Frank Wallace, Sacramento Weed Warriors, for getting the community out to work. 2004: Nicholas Staddon, Monrovia Nursery, for partnering on “Don’t Plant a Pest!” development. 2003: Carolyn Martus, San Diego CNPS, for contacting WalMart about pampas grass. For support of legislative policies that address invasive plants. 2018: Assembly Member Timothy S. Grayson (Concord), for co-authoring Assembly Bill 2470. 2013: Christy Boser, The Nature Conservancy, and Kate Faulkner, National Park Service, for their work on the California Islands BioSecurity Program. 2012: Karen Buhr, California Association of Resource Conservation Districts, for her work on the state’s Fish & Wildlife Strategic Vision Stakeholder Advisory Group. 2012: Bobbi Simpson, National Park Service Exotic Plant Management Team, for pursuing an interagency MOU on weed-free forage. 2011: USDA APHIS Plant Protection & Quarantine, for their work on Q-37 NAPPRA import regulations. 2010: Los Angeles Times, for their coverage of invasive plant issues. 2009: A.G. Kawamura, California Secretary of Food & Agriculture, for working for the creation of an Invasive Species Council and supporting weed programs. 2008: Abe Doherty, California Coastal Conservancy, for guiding the Ocean Protection Council towards evaluating pathways of introduction for aquatic invasive species. 2007: Robert Falconer, California Association of Nurseries & Garden Centers, for his leadership in working to prevent horticultural introduction of invasive plants. 2006: Andrea Fox, California Farm Bureau Federation, Assembly Member Dave Cogdill, and his Legislative Director Erin Guerrero, for their work on behalf of WMA funding (AB 2479). 2005: Assembly Member Lois Wolk, for her efforts to strengthen interagency coordination through creation of an invasive species council (AB 2631). 2004: Wendy West, El Dorado County Agricultural Commissioner’s Office, for inventing and organizing California Invasive Weed Awareness Day at the Capitol. 2003: Kevin O’Neill, Office of Assembly Member Tim Leslie, for creating the Adopt-A-Riverway program to fund weed control. 2009: The Nature Conservancy’s Global Invasive Species Team, for the resources they provided to weed workers around the world before they became a victim of budget cuts earlier this year. 2008: California Dept. of Food and Agriculture’s Integrated Pest Control Branch, for strengthening the Weed Management Area program while protecting it from budget cuts. 2008: 1st Place: Sara Jo Dickens , UC Riverside. 2014 Corpsmember of the Year for Wildland Stewardship: David Huerta, San Joaquin Regional Conservation Corps and Eric Popp, California Conservation Corps, Chico. Submit a short description of the nominee’s achievements and the suggested award to Cal-IPC, by July 31, for consideration for that year’s Awards.